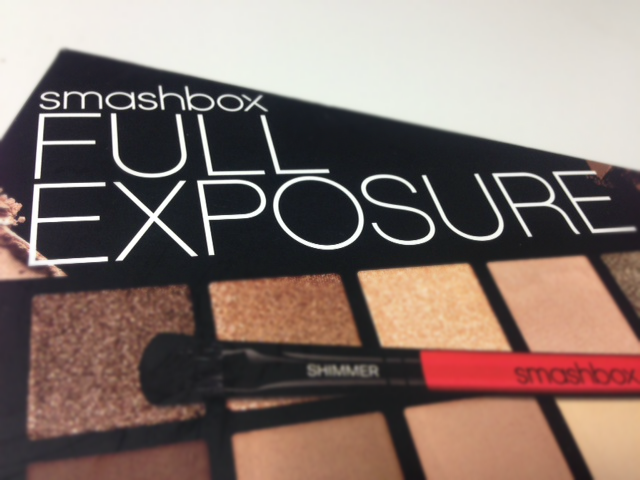 Smashbox Full Exposure Eyeshadow Palette | The Review! 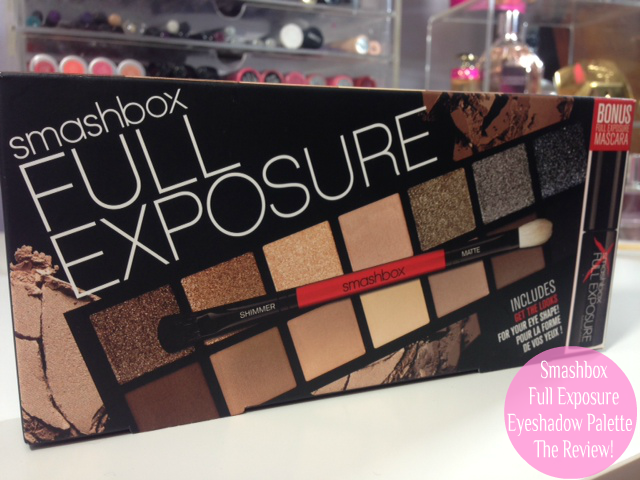 If you follow me over on Twitter you may have seen that the other week I popped to Boots to buy some tablets and walked out £100 poorer.. (excluding the £97 worth of points I spent too) During my trip to buy tablets, I picked up the Smashbox Full Exposure Eyeshadow Palette. I originally picked up a Stila palette but as soon as I saw this I sensibly put the Stila palette back and popped this in my basket. I was immediately drawn to the shimmer shades. I'm not ashamed to admit that I love to fill my lids with gorgeous shimmers and subtle glitter colours, so it took me all of 30 seconds to make my mind up that I needed this in my life! The palette comes with fourteen eyeshadows and costs £36, which I don't think is too bad as it actually only works out to be £2.57 per shadow and it comes complete with a mini Full Exposure mascara and a double ended eyeshadow brush.. which if you check out my pictures you will see it's not there, well my palette didn't come with one and I didn't realise this until after I'd stuck my fingers in each shadow, by which time it's a little too late to take it back, especially considering I don't have the best relationship with the manager who runs the beauty department, although I'm friends with the account manager on Smashbox, it's really not worth the hassle. 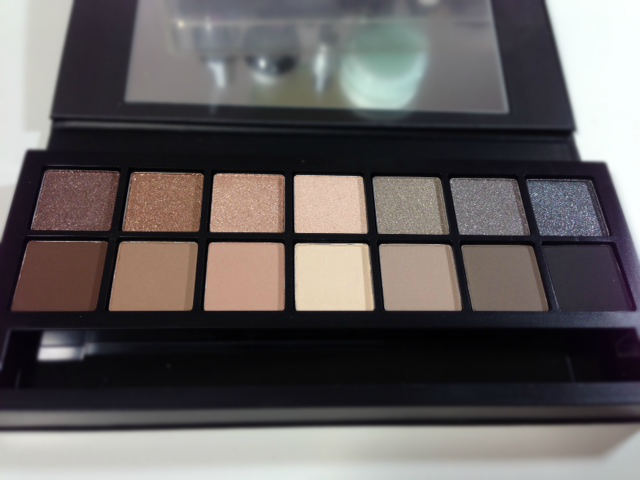 Anyway.... out of the fourteen eyeshadows, the top row consists of seven 'essential shimmers' and seven matte shades at the bottom, ranging from gorgeous nudes to black shades. The palette at a first glance has everything you will need to create a subtle day time look to a dramatic evening look, especially with the mini mascara included. Inside the box it comes with a get the look insert, which gives you a guide on how to apply eyeshadow on six different eye shapes, which I think is great, especially for beginners. None of the shades have names either, they are identified by M1, M2, M3 and so on for the mattes, or S1, S2, S3 and so on for the shimmer. The palette packaging itself is lovely. It's made from thick cardboard that's slightly velvety to touch that a lot of other brands now use. It's magnetic so easy to open and close. The problem with these kind of palettes is that they do get dirty quite quick and I know after a while it will become grubby so I will need to make sure I run a wipe over it after every use. The writing on the palette is iridescent, which I just love, as the colours change depending on what light you hold it in. The matte shades WOW these are gorgeous! They're so creamy and a dream to apply and blend in. 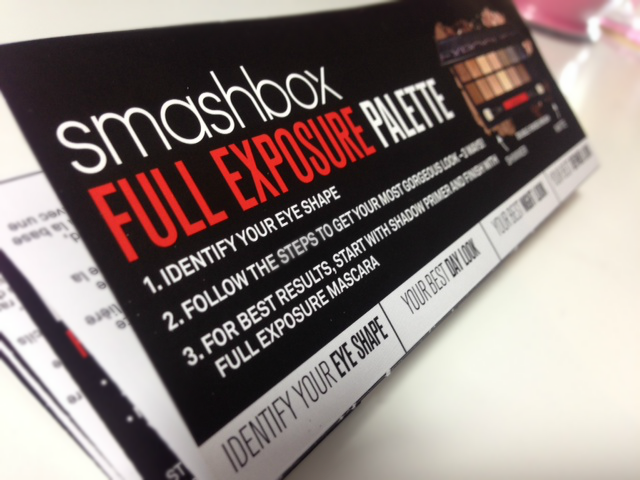 We all know that it's hard to find matte eyeshadows that are easy to blend in, even highend brands have struggled in the past but Smashbox haven't at all. I've never really dabbled too much in matte eyeshadows due to the finish I normally get but these have changed my mind completely, I LOVE THEM! They're velvety and smooth and have next to no fall out. The pigmentation is amazing and they last outstandingly well on the lids without a primer too, but throw on a primer and the shadows aren't going anywhere! 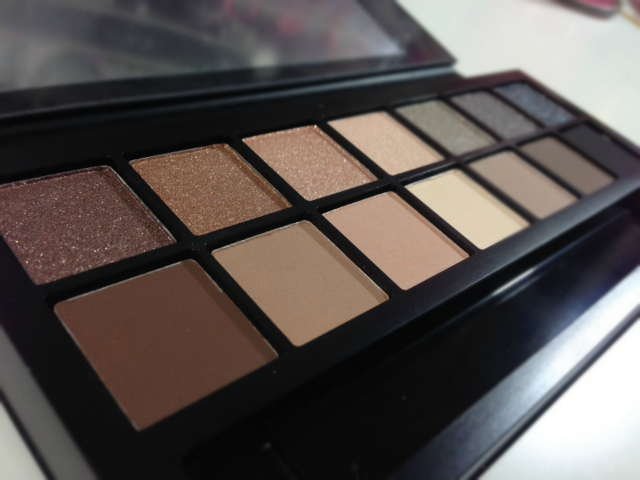 You have seven shades ranging from the palest skin colour all the way up to a gorgeous matte black eyeshadow which I featured in my Top Picks | Black Eyeshadows post last week. These seven shades have changed my mind about matte eyeshadows, which is quite a bold statement to say, but they actually have! The Shimmer Shades Ok aside from two of the shades these aren't shimmers, they're glitter shadows and not very good glitter shadows at that. Considering these were what pulled me into buying this palette I'm extremely disappointed with it them. Now I like glitter eyeshadows but the glitter particles are quite chunky and just disappears on your lids, unless you really pile it on. They aren't easy to blend in at all. The swatch on my arms was after I had run my finger over them multiple times, because the pigmentation just didn't show up. Obviously you could apply these wet to your lids to get the colour to show up more, but I want a shadow that looks amazing dry, not just when it's applied wet and to be honest, they still aren't amazing when applied wet. It's such a shame as the colours in the pans look gorgeous, so I'm hoping that I will find a way to make these work. Now I do like the middle shade S4 and is similar to my makeup geek eyeshadow 'shimmer shimmer' I've used this shade a few times now and really like how this blends in, maybe because this is a shimmer shadow and not a glitter shadow. S3 is quite nice too and really complements S4 when used over the top of it, but that's the extend of the colours that I like out of this row. 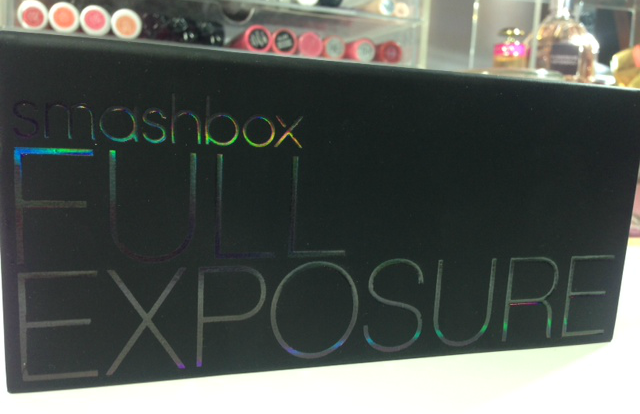 Full Exposure Mascara This is a good mascara but I wouldn't buy this as I have cheaper mascaras that do a better job, but as a freebie it's good and I will definitely finish this up. My overall opinions of this palette is mixed. I adore the matte shades but I'm so disappointed with the shimmer options, aside from two of them, which to be honest are shades that I could live without as I have similar shades that I prefer. To spend £36 on a palette where I only love seven of them is a lot of money to fork out, and unless they brought out the matte shades individually or in a separate palette I just can't recommend this palette based on the seven stand out shades. It' a tough one. If you want some amazing matte shades and have struggled finding some with other brands then go out and buy this BUT if you already own some pretty good matte shades then I personally would bypass this. Now I will not be beaten and I will find a way to make the glitter shadows work out so if and when this does ever happen I will put up another blog post. These are three eye looks I have done with the palette. 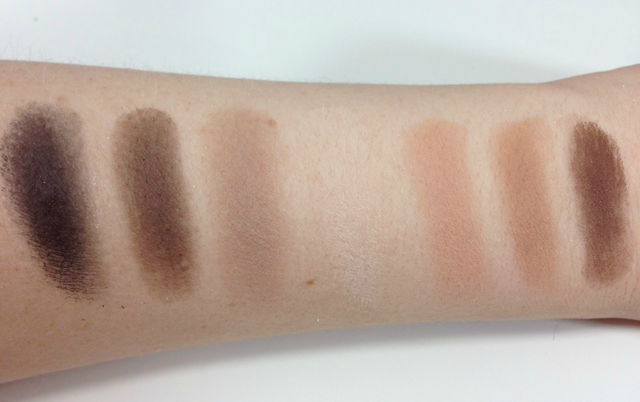 The first one is all matte shades and the middle is the same eyeshadow but with the colour S1 and S3 over the top. 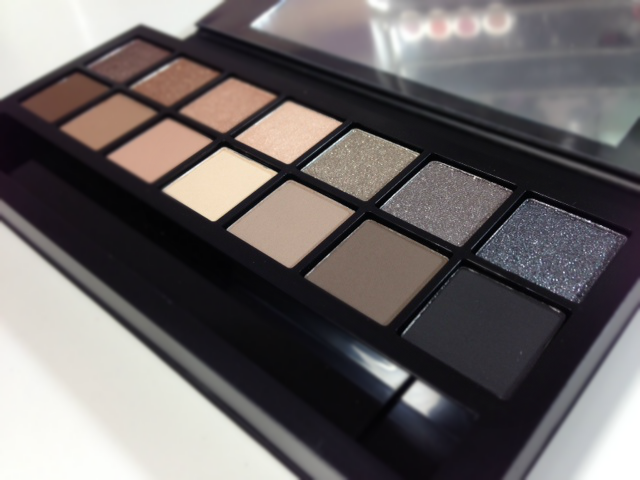 The last look is with all mattes again and obviously I was going for a full on matte smokey eye look! 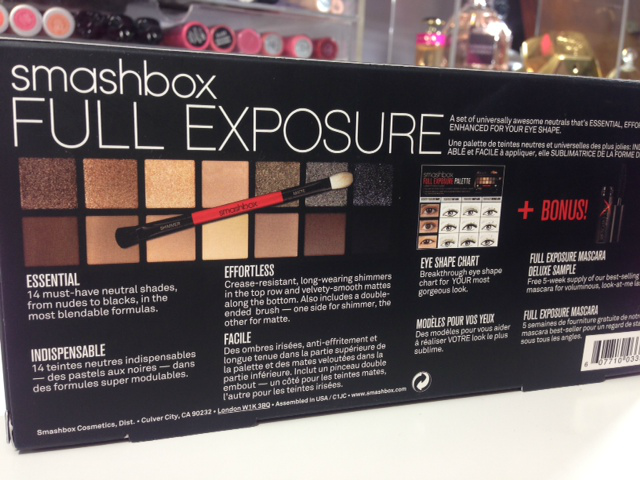 I posted a FOTD #1 | Smashbox Full Exposure Eye Shadow Palette on Tuesday where I did a neutral eye using just this,so go take a look as I received so many compliments about my makeup on the day that I wore this.